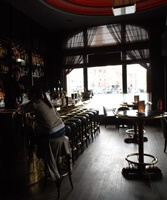 From his perch at the back of the Freddy’s Bar in Hotel De L’Europe, Alfred Heineken liked to watch the world go by and entertain colleagues and friends, ironically over a glass of whiskey. 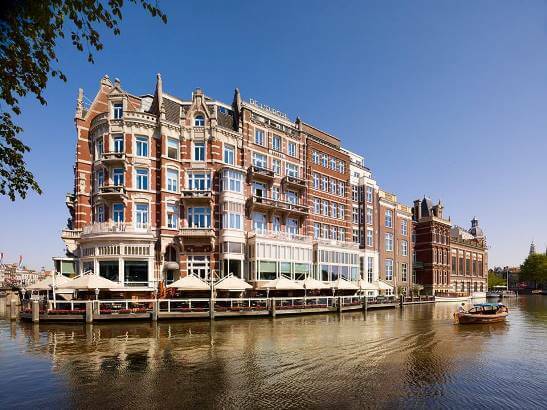 No doubt the fact that the beer brewing mogul owned the palatial building, built in 1896 on the site of a former guard tower next to the Amstel River, added to his legendary status. Lesser known, perhaps, is that he actually purchased the building as a gift for his beloved wife, adding yet another veneer of romance to the already sumptuous red brick façade. Thanks to a head-to-toe 85-million dollar renovation in 2010, however, the hotel and bar look somewhat different than in Freddy’s day. All 88 rooms and suites in the hotel’s original Rondeel Building were refreshed and updated to the 21st century, with additions like iPads, heated flooring, motion-detecting floor lighting, and Bose surround-sound system. The former Theodoor Gilissen Bank next door was transformed into the new “Dutch Masters Wing” with 23 suites, each of which includes a living room, dining room, and a bedroom adorned with a full-size (and sometimes larger) reproduction of a Rijskmuseum masterwork. The annex also now houses the hotel’s heated indoor pool, spa, and fitness center. Reproductions also hang on the walls of the grand central promenade, which welcomes all guests into the building. A plush red carpet extends to the back of the room, passing by chandeliers hanging over sofas and armchairs to the right and left, often filled by suited business makers and hotel guests planning their day over spread-out maps. At the back, along the large glass windows overlooking the Amstel River; wines by the glass, cocktails, and English style afternoon tea are served along with a light snack menu. My room, a premium deluxe (starting at $640 per night), turned out to be the former, pre-renovation bridal suite. 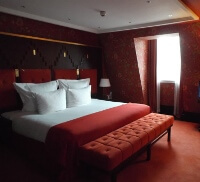 Nonetheless, plenty of seduction remains in the plush red fabrics and tones in the carpeting, drapes, and floral wallpaper, as well as the king-sized Coco-Mat beds, dressed in 300-thread count Egyptian cotton sheets. Nor does it stop in the bathroom, which is slathered in gorgeous Carrara marble. Sitting in the luxurious bathtub, it’s hard not to feel part of some millionaire’s ice cream sundae, except here it’s drizzled with Blaise Mautin shampoo, conditioner, and cream. In other words, it’s the most dangerous type of hotel room when traveling—the one you find hard to leave. But leave you must, especially when hunger calls in the morning. Fortunately, the buffet breakfast, served downstairs in Hoofdstad Brasserie, awarded the Bib Gourmand in 2013 for its cost-quality balance, is worth it, although perhaps not by much. But it’s at Freddy’s that you really want to park late in the evening, not just for the occasional celebrities that show up or the historic provenance, but for a taste of old world class that still seems able to host someone like Ingrid Bergman and not make her feel out of place. Even the adjacent fumoir, with its walk-in humidor, can make you forget the health detriments of smoking, as you find shapes in the wisps of smoke curling from the cigar tip. If you look hard enough, you might see Freddy smile. Book directly online with the hotel or compare rates with agoda.com.